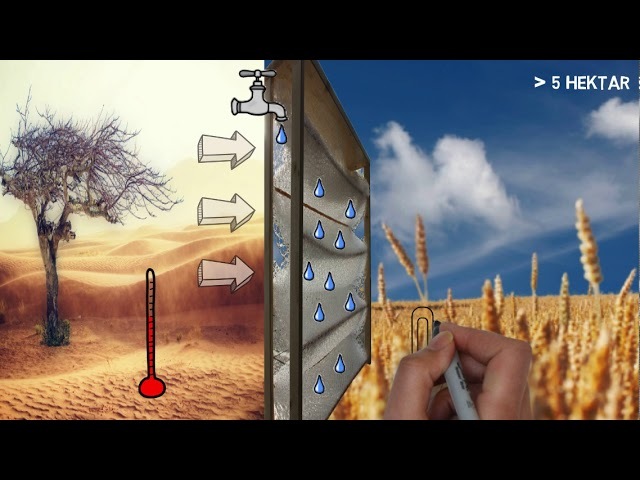 IrrigationNets is a salt free seawatercooling for PV-solar power plants and agriculture. With a single 100 MW solar power plant, we can generate up to 10% more energy, desalinate 40,000,000 literes a day and irrigate an area of more than 50,000 hectare. The pain point in agriculture are drouths and saltwater introusion to groundwater. In many countries saltwater desalination is not cost effective in agricultre. This is why we do not do a normal desalination. We only will have a salt free evaporation of salted water. But this evaporation is scaled a lot and we combine this with cooling of PV-solar power plants. Due to the cooling of the PV-power plants the power plant will generate up to 20% more electric power. Much more than needed for the cooling device. The cooling of the solar power plant is very cost efficient, because the power plant do not need to be adapted to the cooling technology. We will only blow a lot of wind between the rows of the modules. This has a very low cooling efficiency of about 30%. But this is cost effective, because we will lose 70% to agriculture and we will have more yield in agriculture.